A Perfect Vacuum (2011) is one of the most powerful paintings ever made by New Zealander artist, Jeremy Geddes. Part of the Immaterial series, it encapsulates every aspect of his art while making a strong impression on the beholder. Jeremy Geddes studied at the Victorian College of the Arts in Melbourne and has been painting full-time since 2003. His paintings offer both ultra-detailed and disturbing pictures: cosmonauts drifting in empty urban landscapes; people and pigeons floating in darkness; buildings spectacularly blown away; or a combination of these, like in A Perfect Vacuum. This oil painting from 2011 shows us a little girl hunched up in her pyjamas. Instead of being on the large bed, as you would expect, she’s hovering above it, as if she had been propelled into the bedroom through the window, smashed to pieces. She’s facing the glass shards, eyes wide open, possibly looking at the disturbing pigeon on the other side of the window. Her left arm covers most of her face, masking her features and emotions, making her the silent character of an uncanny scene. Jeremy Geddes’s artwork astonishes in its rendering of light and realistic details, turning the oil paint into a still from a sci-fi. Oil painting has been praised for its capacity to capture tremendous light effects since the Renaissance. It allows artists to depict the particulars more accurately than with any other medium. 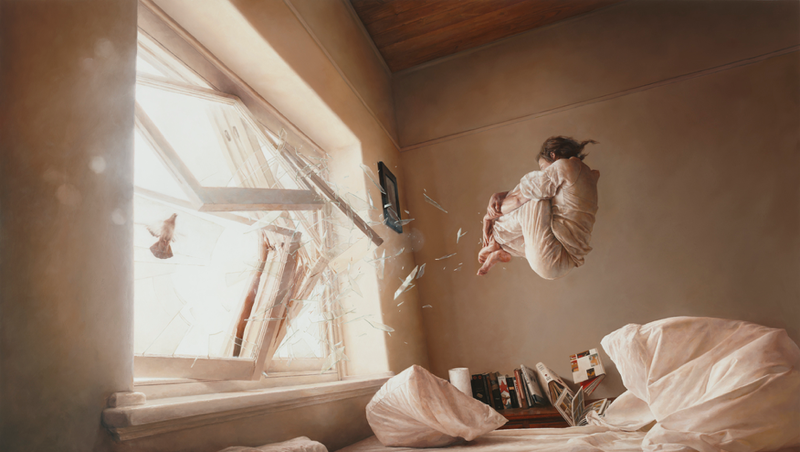 In A Perfect Vacuum, Jeremy Geddes uses this traditional art form to play the trick further: the painting becomes the snapshot of an instant, of that moment when the girl floats over the room. Even the beige and totally realistic background seems to be carried away by the blow and her moving across the picture, from left to right. The whole therefore emphasises the instantaneous picture, and our sense of orientation and gravity are seriously challenged. The point of view further dramatises the scene, as we see it from below. The reasons for her propulsion and the shattered window hangs in the air, leaving the viewer with a palpable sense of mystery and puzzle, in this disordered room. This unsettling feeling is ubiquitous in Jeremy Geddes’s production. Why would an unidentified cosmonaut seemingly fall onto the gutter of a grey and totally deserted city, with a white pigeon calmly standing in front of him, like in The Street (2010)? Another painting from the same series very close to A Perfect Vacuum is Acedia (2012): a girl and two pigeons have broken through a wall into a tiled, old-fashioned bathroom, and hover in the middle of it. However, A Perfect Vacuum seems more effective to me because it questions even more deeply our sense of reality with its intimate setting. It reminds me of the type of pictures taken after a natural disaster, an experience which can shake your beliefs and change your life forever in only one instant, like in the award-winning series Retracing our Steps: Fukushima Exclusion Zone – 2011-2016 by the photographs Carlos Ayesta and Guillaume Bression. One can assume the title A Perfect Vacuum also refers to this tension between the known order and the unknown chaos, between the light and airy and the force of gravity, between the ephemeral scene and the permanent picture of it. Much more could be read into it, but Jeremy Geddes probably leaves it open-ended willingly to unsettle the viewer, like in his paintings. It's not easy, therefore, to fully uncover A Perfect Vacuum and to place Jeremy Geddes’s artworks into a genre. As an oil painting, A Perfect Vacuum comes very close to documentary photography, but it also introduces a surrealist or supernatural element which turns the picture into a gloomy scene not so far from a thriller. Its meaning, like the little girl, is still hanging in the air.